ANAN had its grand opening on 26th April 2017. By then, the restaurant had soaked in its surroundings—the weathered “Chợ Cũ” wet market along Ton That Dam—and distilled the techniques of the local food vendors who line the street into dishes like the Dalat pizza, a take on banh trang nuong, the lemongrass pork chop, an elevated version of the two-dollar com tam, and ANAN’s tacos, a Mexican-inspired re-imagining of banh xeo pancakes. 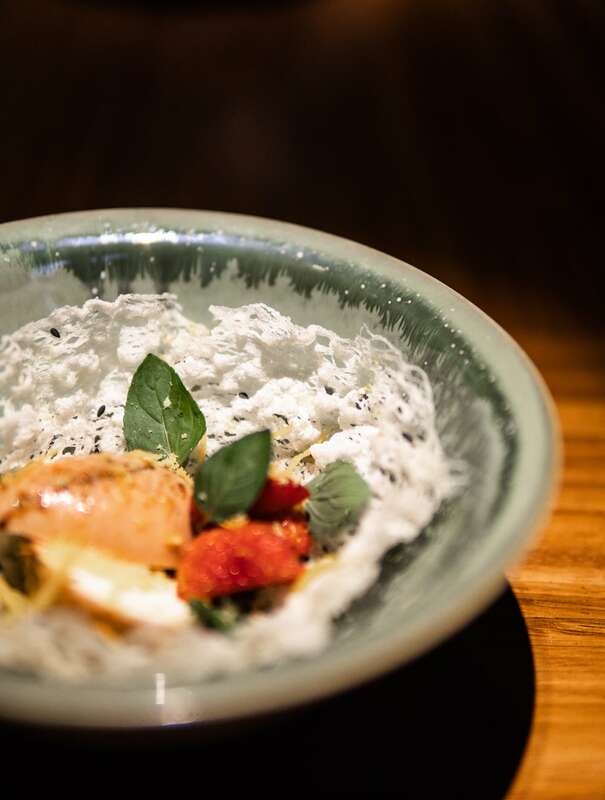 ANAN’s chef and founder Peter Cuong Franklin has now opened NHAU NHAU seventeen-months later. Seventeen-months later comes the understatedly elegant sequel. Of course, after ANAN, which means “eat, eat,” comes NHAU NHAU, “drink, drink.” This “modern Vietnamese dining bar” is on the second floor of the same building as ANAN at 89 Ton That Dam. And this time the focus is on pho and “nhau” culture. 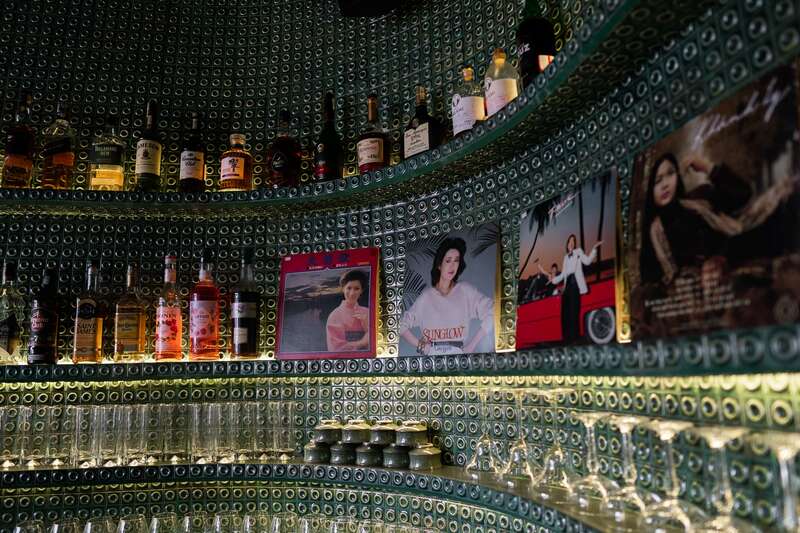 NHAU NHAU’s interior is a tribute to swinging Saigon circa 1960. At the top of the stairs—which you’ll miss if you take the elevator—is a mural of Vietnamese singer and icon Khanh Ly by French-Vietnamese graffiti artist Suby One (who also did the other murals at ANAN). Below that is a sign in retro lettering by the same artist that reads “Không say không về”—or “Don’t go home till you’re drunk.” It’s a reminder that, despite the elevated Vietnamese cuisine, this is a modern “nhau” drinking and eating joint—something like Japanese izakayas, Thai aahaan kap, Spanish tapas bars, or American taverns. 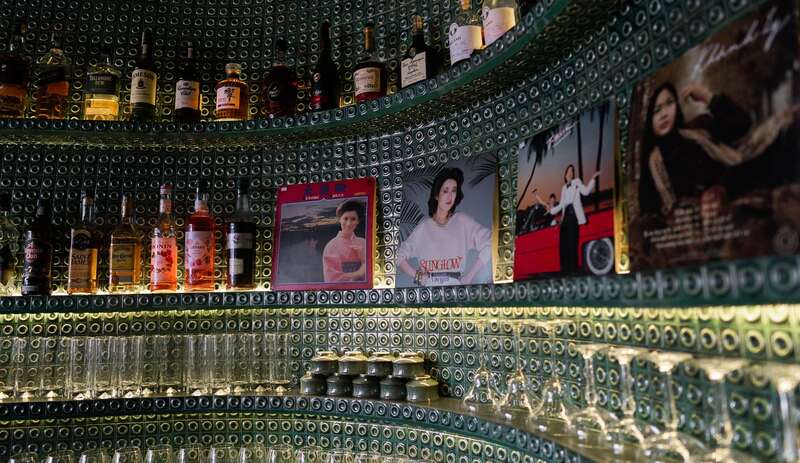 The Sean Dix-designed interior with dark-turquoise Bac Trang wall tiles, a sturdy wooden counter centerpiece and stools, and old records selected by local crate digger and DJ, Datodeo. Peter Cuong Franklin worked with NHAU NHAU’s American interior designer, Sean Dix, at his earlier restaurants in Hong Kong. 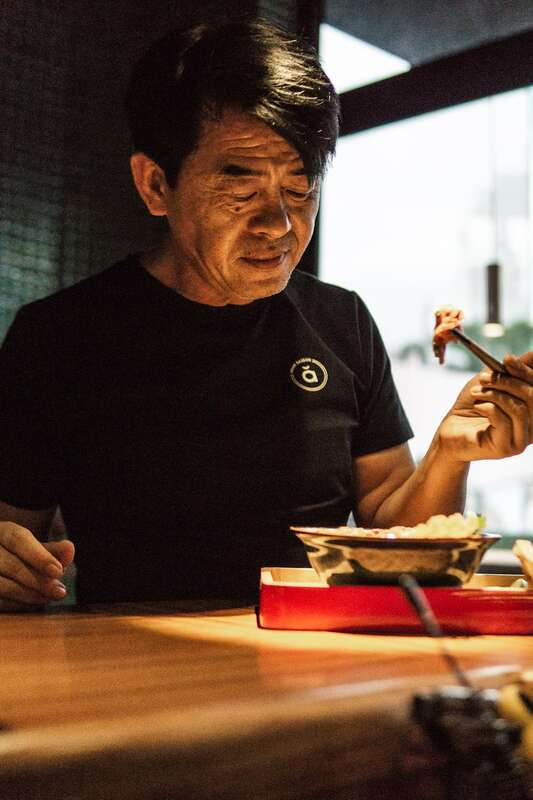 Now NHAU NHAU is Dix’s third space to open in Saigon in recent months—first came Sake Central and then the modern izakaya Renkon. There’s dark-turquoise Bac Trang wall tiles, and a sturdy wooden counter centerpiece and stools. Old records selected by local crate digger and DJ Datodeo, like ones by Vietnamese composer and pianist Nguyen Anh 9, crackle on the turntable overlooked by oak-framed record sleeves from the era. And although ANAN’s rooftop still presents one of the best low-rise views of the city, NHAU NHAU’s balcony is an even better place to take in the energy of the market below as it winds down into its night shift. True to “nhau” culture, the drinks are mostly local. 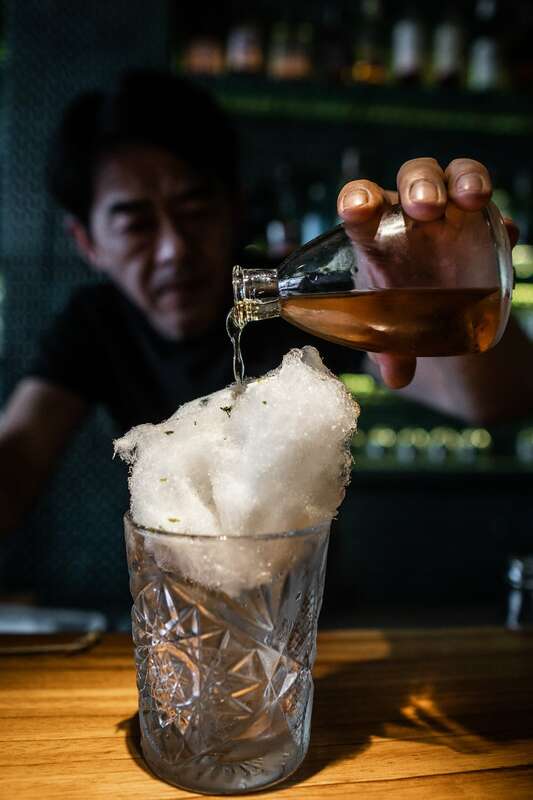 There’s sake from Hue, rice spirit from central and northern Vietnam, cocktails garnished with sprigs of Dalat lavender or filled with cotton candy, and shooters like the quail egg shot, that contains a quail foetus, that are as headline-worthy as the US $100 pho. The cotton candy old fashioned with Bourbon whiskey, Angostura bitters, and a ball of candy floss that evaporates on contact with the mix. There’s a coconut worm shot too with the grub caramelized and impaled on a skewer over a glass of rum and coconut cream. And, naturally, for a dining bar focused on pho, there’s a pho shot that combines rice spirit, pho broth and herbs, and Sriracha sauce. ANAN’s US $100 pho was part of the restaurant’s year-and-a-half long quest to create the perfect bowl of Vietnamese noodles. While other restaurants might have continued to push the portion sizes while layering on more and more extravagant ingredients, NHAU NHAU’s finished pho bowls are concentrated servings of quintessentially Vietnamese comfort food at a much more affordable price. The pick is the pho dac biet. NHAU NHAU’s finished pho bowls are concentrated servings of quintessentially Vietnamese comfort food. 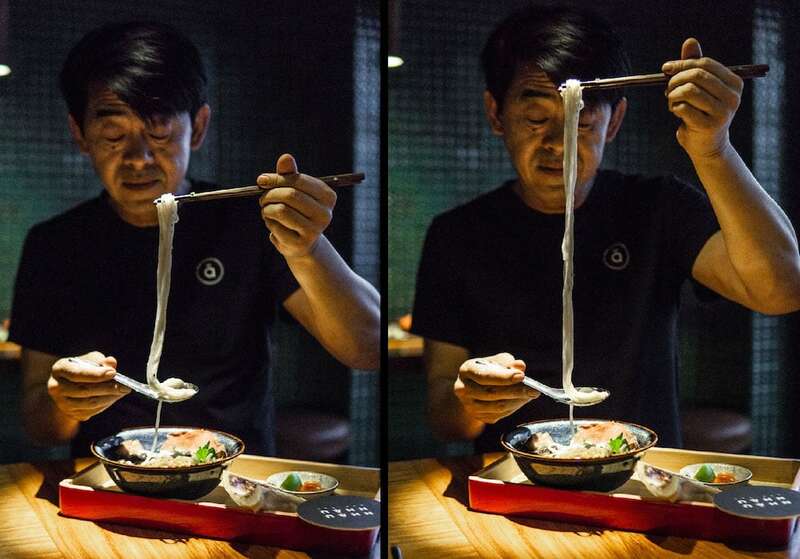 This “special” pho bathes fifty grams of hand-cut noodles in a rich umami broth. Around the side of the bowl are tender slices of rare wagyu, and soaking in the soup are cubes of 24-hour cooked beef rib over soft-chewy tendon. There’s also black truffle, a cured quail egg, and a hunk of bone hangs out of the bowl filled with marrow you scoop out to increase the richness quotient even further in what might be the best pho served anywhere. If the chef’s around, ask him to take you through the appreciative step-by-step process of eating the dish. The BBQ Pork Banh Mi, a modern take on the Vietnamese street food that also takes inspiration from the BLT. Besides the pho dac biet, there’s a beef stew pho and a truffle pho, and a rare duck breast and confit duck leg pho—NHAU NHAU’s duck tai chin pho. Although pho is undoubtedly the focus, there are some classics from downstairs like the tacos and imperial rolls, sometimes with a makeover like the carpaccio which now comes as beef tartare on perfectly-sized triangles of rice cracker. 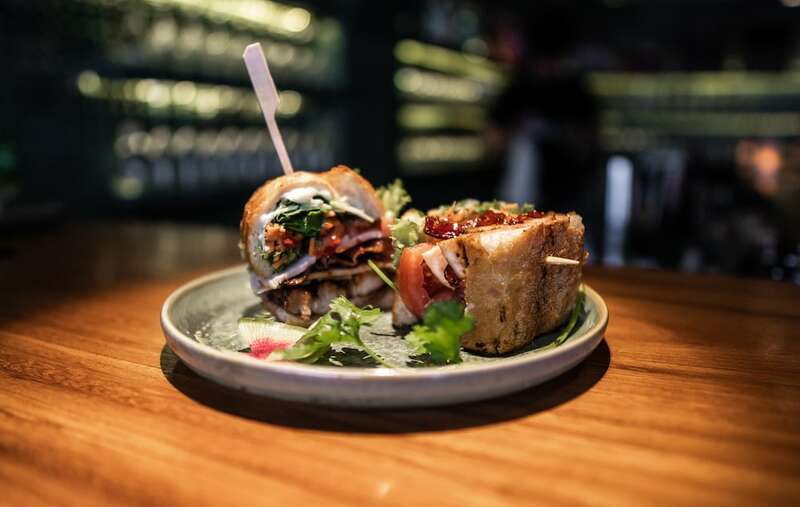 Peter Cuong Franklin has also been experimenting with new dishes—such as the BBQ pork banh mi that’s like a Vietnamese BLT served with a spoonful of Hoi An chili sauce, and the salmon tartare that’s served the same updated way as the beef. NHAU NHAU’s salmon tartare with Norwegian salmon and salmon roe served on a bite-sized triangle of rice cracker. Finally, for dessert, the broken lime is still an indispensable classic, with the tactile touch of smashing the lime-vanilla mousse filled ball with a spoon before eating. There’s also NHAU NHAU’s marshmallow & chocolate with grilled rice cracker, peanut butter, coconut, chocolate, marshmallow, and tropical fruits, and the chocolate egg that sits on a nest of grilled rice paper. For dessert, NHAU NHAU’s chocolate egg with a rice paper bird’s nest, salted duck cream egg, chocolate, and passion fruit. 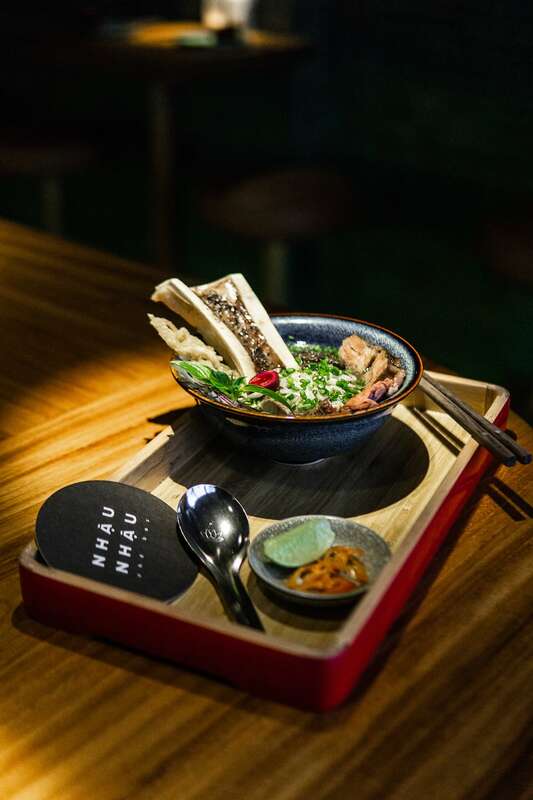 Like the concentrated bowls of pho that they serve, NHAU NHAU is a focused version of all the things that made ANAN a success. But, if you like, you can still order ANAN’s off-menu US $100 pho and banh mi from downstairs. Try: NHAU NHAU’s focused on pho. The ANAN team have been perfecting the noodle dish for the year-and-a-half since they opened. For proof of their progress, give their pho dac biet a try, or for something different, try their duck tai chin pho. Test: NHAU NHAU is a tribute to Vietnamese drinking and eating culture, so explore the homegrown sakes and stronger rice spirits from central and northern Vietnam. And if you’re feeling more adventurous, test the coconut worm or quail egg shots. Shoot: Take the stairs and snap a picture when you’re met by a mural of iconic singer Khanh Ly by French-Vietnamese graffiti artist Suby One. Or take a photo on the balcony looking down at District 1’s last wet market. 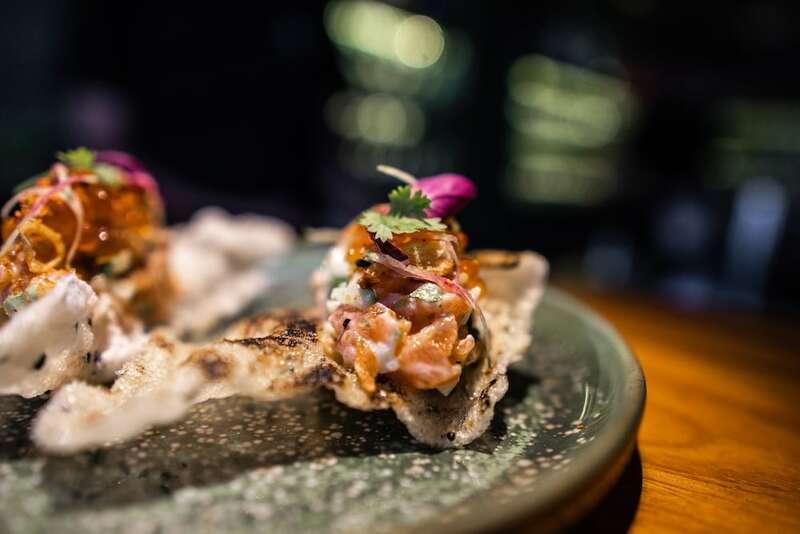 In short: NHAU NHAU is everything that made ANAN a success distilled down to an 18-seat dining bar.